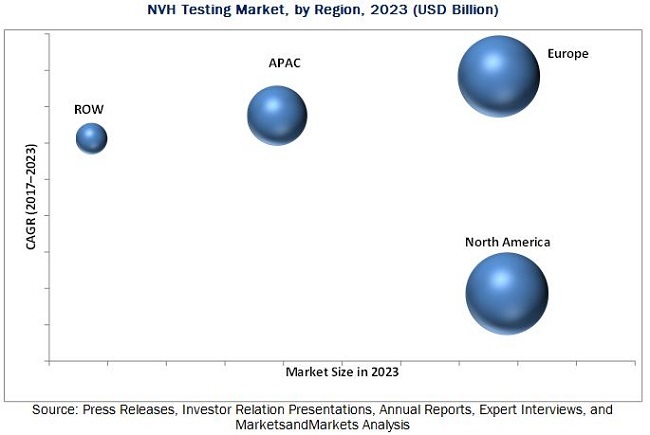 [161 Pages Report] The NVH testing market was valued at USD 1.64 Billion in 2016 and is expected to reach USD 2.21 Billion by 2023, at a CAGR of 4.2% during the forecast period. The base year considered for the study is 2016, and the forecast period is between 2017 and 2023. Increase in environmental noise levels is affecting the global population in adverse ways resulting in severe repercussions on the health of citizens across several countries. Some of the short-term and long-term health problems, which are caused by high levels of noise pollution, include hearing impairment, cardiovascular effects, sleep disturbance, and poor work and school performance, and so on. These factors have resulted in the adoption of stringent regulations by several countries across the globe, which is expected to have a positive impact on the demand for NVH testing solutions, which, in turn, would drive the growth of the NVH testing market. The objective of the report is to provide a detailed analysis of the NVH testing market based on type, application, end user, and geography. The report provides detailed information regarding the major factors, such as drivers, restraints, opportunities, and challenges, influencing the growth of the NVH testing market. The report also provides a detailed overview of the value chain of the NVH testing market. The NVH testing market comprises component manufacturers, assemblers, and distributors. The players involved in the development of NVH testing products and solutions include National Instruments (US), Brüel & Kjær (Denmark), Siemens PLM Software (US), HEAD acoustics (Germany), m+p international (Germany), imc Meßsysteme (Germany), Dewesoft (Slovenia), GRAS Sound & Vibration (Denmark), Prosig (UK), and Signal.X (US). This research report categorizes the overall NVH testing market on the basis of type, application, end user, and geography. The NVH testing market is estimated to be valued at USD 1.72 Billion in 2017 and is projected to reach USD 2.21 Billion by 2023, at a CAGR of 4.2% between 2017 and 2023. The growth of the NVH testing market is propelled by the adoption of stringent government regulations to reduce noise pollution and increasing demand for automotive and car infotainment system. 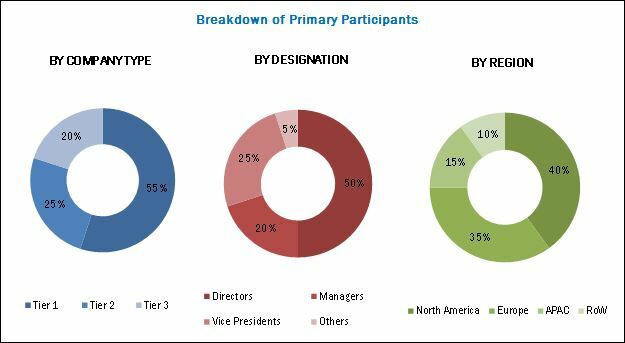 Emergence of new application areas for NVH testing solutions and advancement in sensor and processor technologies are the key opportunities for the players in the NVH testing market. The NVH testing market has been segmented on the basis of type, application, end user, and geography. On the basis of type, hardware held a larger share of the NVH testing market in 2016. Increasing use of mechanical and electronic components in automotive, aircraft, and industrial machinery has led to the dominance of hardware in the NVH testing market. Hardware is further classified into sensors and transducers, analyzers, meters, data acquisition systems, signal conditioners, and shakers and controllers. The NVH testing market for the telecom testing application is expected to register the highest CAGR between 2017 and 2023. Advancement in telecommunications technology affecting features of design including generation of acoustic noise and its impact on human lives have driven the demand for the telecom testing application in the NVH testing market. On the basis of end user, the NVH testing market for power generation is expected to register the highest CAGR between 2017 and 2023. Stringent legislative obligations placing high pressure on OEMs to design and manufacture low noise level equipment is one of the major factors leading to the growth of the NVH testing market for power generation. North America held the largest share of the NVH testing market in 2016. North America is the most technologically advanced and has the presence of major automotive and aerospace and defense companies; this factor has resulted in the increased demand for NVH testing applications in this region. Moreover, the presence of prominent NVH testing solutions providers is expected to support the growth of the NVH testing market in North America. The major restraint for the NVH testing market is the increasing demand for secondhand and rental NVH testing equipment. Top companies such as National Instruments (US), Brüel & Kjær (Denmark), Siemens PLM Software (US), HEAD acoustics (Germany), m+p international (Germany), imc Meßsysteme (Germany), Dewesoft (Slovenia), GRAS Sound & Vibration (Denmark), Prosig (UK), and Signal.X (US) are adopting the strategy of product launches and acquisitions for strengthening their position in the NVH testing market by either enhancing their existing portfolio or acquiring smaller players in the NVH testing market. Brüel & Kjær has adopted the inorganic growth strategy to strengthen their position in the NVH testing market. In July 2016, Brüel & Kjær acquired Discom GmbH, a German-based solution provider of automotive vibration and transmission sound test system. Moreover, the company acquired Sound & Vibration Technology, a UK-based sound and vibration test solutions provider. These acquisitions enabled Brüel & Kjær to increase its contribution in the NVH testing market.